ByeBye Odor Room Deodorizer is an Ostomy Deodorizer specially formulated to neutralize offensive odors in any room. This Room Deodorizer is a non-aerosol formulation that eliminates odors without a chemical smell or fragrance. Many Ostomy Room Deodorizers only mask or hide odor with a fragrance smell, but ByeBye Odor Room Deodorizer absorbs odors chemically. Manufactured by Dermarite, ByeBye Odor Deodorizer removes malodors and freshens the air within your room. 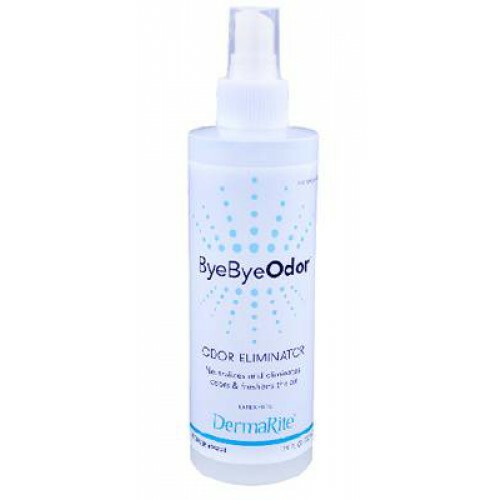 Dermarite ByeBye Odor Room Deodorizer is an ultra concentrated formula that deactivates foul odors on contact. This ostomy room deodorizer comes in Original Scent. ByeBye Odor Room Deodorizer Product Number: 00258. Size: 7.5 Ounce Pump Spray Bottle. Active Ingredients: Quaternary Ammonium Chlorides, Dimethyl, Benzyl, Ammonium Chlorides. Dermarite ByeBye Odor Room Deodorizer MSDS. Product arrived intact and on time. Great service. This odor spray takes care of biological odors in any room. It is a pump safe so that there is no aerosol.